LTK (Legal Test Kitchen) is just that - a test kitchen that ventures into uncharted waters and pushes the boundaries of innovation in both its bar and restaurant menus. Experimentation is encouraged. 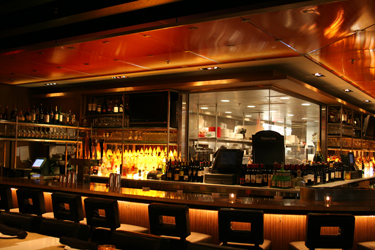 With inspired seasonal cocktails, an award-winning wine list, and multicultural non-coursed dining options, LTK offers a cutting-edge yet comfortable environment. It's both a destination as well as neighborhood hangout for those who appreciate premium food and drink. The innovative LTK cuisine includes a menu, broken down into categories with chic names such as: Bare (sushi and raw bar), Nosh (appetizers), Simmer (soups), Nibble (small plates), Refresh (salads) and Comfort (Main Dishes). Some of the globally influenced menu options include a selection of Pho, tempura, Mysore Rasam Soup, Angry Lobster and grilled Skirt Steak Frite. The multicultural cuisine will be derived from a variety of ethnicities such as Asian, Indian, European, South American, and the United States.